Over the years my wife and I have always tried to teach our kids by example. We have taken them to marches for issues they care about. The environment, equality and other issues are often discussed over the dinner table in our house. But the pride I felt when my oldest son, Donovan (12) was asked (and eagerly replied YES!) to prepare a testimony for the Environmental Protection Agency is hard to top. Sometimes it feels like this country is lost, with no understanding or agreement on anything. It is in times like these when the people of the United States of America need to stand up to the government. The people need a voice. Not a polluted world, not money, not war, they need a voice. Recently, more and more people have been coming out of their comfort zone and speaking up, loud enough to be heard and felt in the White House. Recently, I had the chance to use my voice by representing the state of Maine and testifying before the Environmental Protection Agency. Working with Moms Clean Air Force, I was asked to give my opinion on President Trump’s plan to roll back mercury and air toxin rules across the country. Until yesterday, I believed that public hearings weren’t important. I believed the people in charge, who sat through dozens of testimonies and took hundreds of notes, didn’t bother to listen. But after getting my chance and walking up to the stage and reading my testimony, it was clear that this public hearing is very important with the state that the planet and our environment is in. Working with the Moms Clean Air Force was the best experience I have had in a long time. The organization flew us down to Washington, D.C. and we stayed at the Hyatt Hotel. 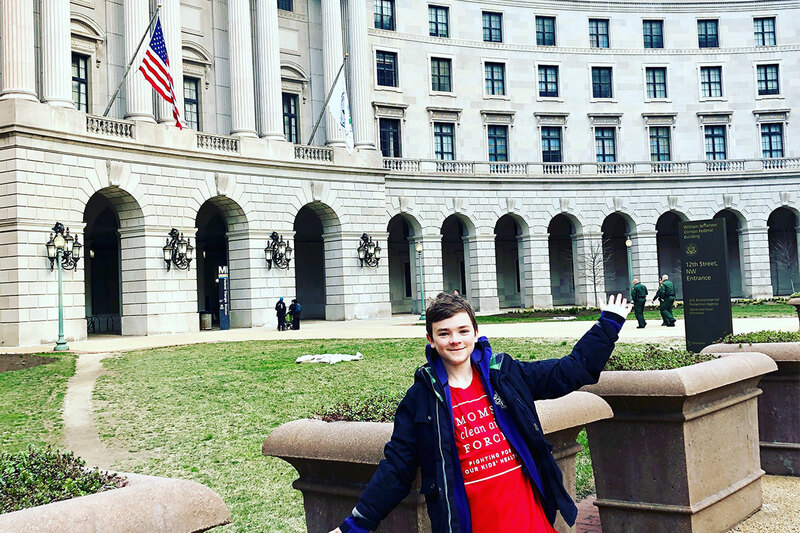 We met with the other concerned parents and kids who were ready to protest the proposal that the Environmental Protection Agency offered that wanted to weaken regulations on mercury levels in the country and put kids like me and my brother and sister in danger. Mercury is a serious problem. According to the United States Food and Drug Administration, too much mercury for adults causes symptoms like lack of hearing and speech, struggle with coordination, or even nerve loss in hands and the face. Mercury keeps building up inside the body throughout your life if you don’t treat it. As a result of this, it is even more dangerous if children, or pregnant women, are diagnosed with Mercury Poisoning. For children and pregnant women, mercury poisoning can cause visual-spatial awareness problems, cognition, speech and language development difficulty, and threaten unborn babies in the womb. Mercury needs to be controlled like it has been for years. This effort is just a way that our President can keep a promise to save the coal industry even if it means killing our environment. Even if he did, it would only mean a few more years and then we would be in the same place but with more pollution. If more people protest and speak up, the EPA will have to listen. This is why we need more people in this country to be strong and speak for what is right. My experience was so important to me. I felt more confident in my voice. I felt more eager to speak up. I was the youngest person speaking before the panel at the age of twelve and it felt awesome. The children are the future of this country, and we need to be more involved with this country, to make sure we have a clean environment to live in so that those kids, like me are healthy and ready to take over.